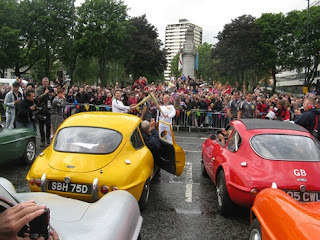 Frost Auto Restoration Techniques Ltd Blog: Have you seen a classic Rochdale Olympic? Have you seen a classic Rochdale Olympic? When the Olympic Torch passed through the Lancashire town of Rochdale last month, on its way to the 2012 Olympic Games in London, the city had a chance to celebrate a 52-year anniversary. In 1960, Rochdale Motor Panels was on the crest of a wave with the smash-hit GT model, and named the ground-breaking new monocoque car after the Rome Olympics taking place that year. The Rochdale Olympic was only the second true glassfibre monocoque road car ever made (the first was the Lotus Elite), and about 400 were built between 1959-72. Fifty-two years later, the Olympic torch arrived in Rochdale and members of the Rochdale Owners Club overcame local flooding and the wettest day of the year to enjoy the celebrations. Eight brightly-coloured Rochdales drove from all over the country to form the centre part of the town’s celebrations, and Rochdale’s Cultural Trust, Link4Life, hosted a dinner for ROC members, past workers, and families of the original designer and owners. The cars were displayed in front of the Town Hall for the day, and went on to form part of the Olympic procession through the centre of town. Looking surprisingly modern, they received the warmest of Lancashire welcomes, especially from the many people who had known the firm and its workers years ago. Designed by Richard Parker – whose widow and daughter made the trip from Bristol to be part of the day – the Rochdale Olympic was named after the 1960 Rome Olympic Games and was built in the town by Rochdale Motor Panels from 1960 to 1972. The company pioneered glassfibre car construction, making aluminium car bodies from 1948 and glassfibre from 1954. This sounds like a lot of fun. Racing vintage cars and displays is something that we cannot see everyday. I have heard a lot about Rochdale Motor Panels and Engineering in Rochdale though this event is quite a surprise for me. I am glad that I have read this post and seeing this picture makes me say that it is really a success.